Well, I almost care about what is going on in Justice League #18. That’s certainly a step up from most of the previous issues. 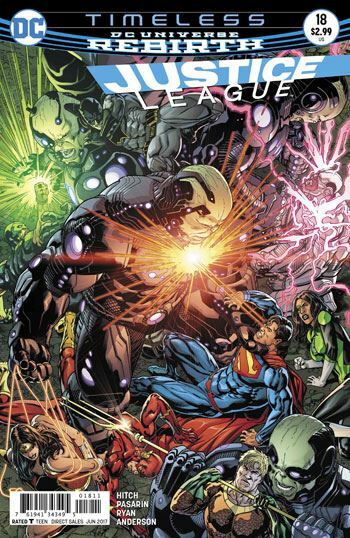 Although the whole League does appear in the latest issue, the story is almost entirely centred on Superman and Batman, working with the mysterious people in the Infinity Building. I hadn’t really caught this until now, but the youths are children of current heroes, come back in time. Children of heroes in the Infinity Building? Is this a new Infinity, Inc.? I can’t say I’m bursting with excitement over this, as I fear, if I am right, that Bryan Hitch will wind up writing that book into the ground like he is doing with this one. But I did love Infinity, Inc. in its heyday, and wouldn’t mind a revival. I could happily reminisce about Infinity, Inc. for the rest of this review, but alas, that is not my job. Great art by Pasarin and Ryan. I have to acknowledge that. As always, each page just looks superb. 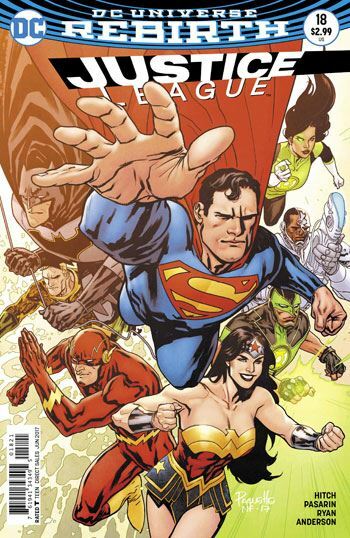 Reference is made to events from the recent Superman: Reborn storyline, and the heroes act together, though spread through time and space, to stop everything from being wiped out. There is a not terribly surprising surprise ending. And I’ve cracked 200 words on this. I could end the review, or I could talk more about how much I loved Infinity, Inc. Remember that great Crisis issue with Helix where the border of the pages was done like a Monopoly game? Good times.